Although often dismissed as a fanciful swashbuckling adventure story, the Three Musketeers is a profound statement of human character and social evolution, depicting four individuals who through their energy, courage, resourcefulness, personal values and loyalty to one another are able to influence the course of events at the national and international level. While the story is fantasy, the force of personality and human values it depicts are true to life. The story also provides an insightful glimpse into the dynamics of French society during one of the most remarkable periods in its history. 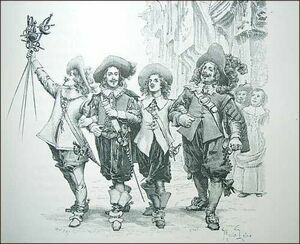 The Three Musketeers (Les Trois Mousquetaires) is a novel by Alexandre Dumas, père. It recounts the adventures of a young man named d'Artagnan after he leaves home to become a musketeer. D'Artagnan is not one of the musketeers of the title; those are his friends Athos, Porthos, and Aramis - inseparable men who chant the motto "One for all, and all for one". The Three Musketeers was first published in serial form in the magazine Le Siècle between March and July 1844. Dumas claimed it was based on manuscripts he had discovered in the Bibliothèque Nationale. It was later proven that Dumas had based his work on the book Mémoires de Monsieur d'Artagnan, capitaine lieutenant de la première compagnie des Mousquetaires du Roi (Memoirs of Mister d'Artagnan, Lieutenant Captain of the first company of the King's Musketeers) by Gatien de Courtilz de Sandras (Cologne, 1700). The book was borrowed from the Marseille public library, and the card-index remains to this day; Dumas kept the book when he went back to Paris. Dumas' version of the story covers the adventures of d'Artagnan and his friends from 1625 to 1628, as they are involved in intrigues involving the weak King Louis XIII of France, his powerful and cunning advisor Cardinal Richelieu, the beautiful Queen Anne of Austria, her English lover, George Villiers, 1st Duke of Buckingham, and the Siege of La Rochelle. Adding to the intrigue are the mysterious Milady de Winter, and Richelieu's right-hand man, the Comte de Rochefort. The main character, d'Artagnan, comes from an impoverished noble family of Gascony, presumably near a place called Artagnan. In April 1625, he leaves home for Paris to fulfill his greatest dream: becoming a Musketeer of the Guard. Fortunately, his Father knows M. De Treville, Captain of the Company of Musketeers (also a Gascon) and has written a letter of introduction. On his journey, after his odd colored horse is ridiculed by a passing gentleman, he begins arguing with the mysterious man with a black cape and a scar on his face. Assaulted by the servants of the inn where the argument took place-the inn's owner feeling that it would be better to support the well-dressed gentleman (Comte de Rochefort) rather than the impudent youth-d'Artagnan is left broken and bleeding while the mysterious stranger calmly leaves without bothering to conclude the affair. Unfortunately, the gentleman is made aware of the Senior d'Artagnan's letter of introduction. When d'Artagnan regains consciousness, he realizes that the gentleman has stolen his letter. The innkeeper manages to get his hands on much of the lad's money as he recuperates as well. In Paris, d'Artagnan goes straight to the Hôtel Treville, hangout of the Musketeers, but without his father's letter he is received somewhat coldly by M. De Treville. The same day, due to both his pride and an urge to ingratiate himself with those he wished to join, d'Artagnan is challenged to a duel by three musketeers: Athos, Porthos, and Aramis, who happen to be very close friends and who encounter d'Artagnan one after the other. The four men meet and, after a brief period of confusion when the three friends realize d'Artagnan owes each a debt of honor that day, d'Artagnan begins to fight Athos (the first challenger). They are interrupted by elements of the Cardinal Richelieu's guards, who threaten to arrest them because duels are forbidden by royal decree. The three musketeers and d'Artagnan unite to defeat the Cardinal's guards. In this manner, the young Gascon earns the grace of M. de Treville and the friendship of Athos, Porthos and Aramis, and becomes a soldier in the Royal Guard in the company of M. Des Essart. This is the first step in becoming a Musketeer, as all who serve in the Musketeers must have military experience in another, lesser unit. After obtaining lodging and hiring a servant (Planchet), he meets his aging landlord's pretty young wife, Constance Bonacieux, with whom he falls instantly in love. She is dressmaker and confidant to the Queen, Anne of Austria. Unhappy in her marriage with Louis XIII, the Queen flirts with the English Prime Minister, the Duke of Buckingham. Constance and d'Artagnan help the two meet, and the Queen presents her lover some diamond jewels originally given to her by her husband the King. However, Cardinal de Richelieu, informed by his spies of the gift, persuades the King to invite the Queen to a ball where she would be expected to wear the diamonds. D'Artagnan and his friends leave for London to get the diamonds back from Buckingham. The voyage is full of dangers set by the Cardinal. Athos, Porthos and Aramis are badly wounded on the way; only d'Artagnan arrives in England. He retrieves the jewels and returns them to Queen Anne, just in time to save her honour. The Cardinal is impressed enough to invite d'Artagnan to join his own corps, but the lad passes on this offer out of loyalty to his friends. Since he is not in the Cardinal's service, he does not have the Cardinal's protection, however. The Cardinal's revenge comes swiftly: the next evening, Constance is kidnapped. D'Artagnan brings his friends back to Paris and tries to find her, but fails. Meanwhile, he befriends the Count de Winter, an English nobleman who introduces him to his sister-in-law, Milady de Winter. Despite his love for Constance and his suspicions that Milady is the Cardinal's spy, he finds it very hard to resist her charms. He almost falls into the trap, believing the Countess of Winter is in love with him, when he accidentally finds a letter of hers to the one she really loves, the Count de Wardes. Helped by Milady's chambermaid Kitty, who is infatuated with him, d'Artagnan has his revenge: he spends a night with Milady, pretending to be M. de Wardes in the darkened room. He admits the truth though, and she tries to slay him with a dagger. In the struggle, d'Artagnan discovers that Milady has a fleur-de-lis burned into her shoulder, marking her as a felon. Remembering a story that Athos had once told him, d'Artagnan suddenly realizes with horror that Milady is not, as he thought, an English noble lady, but in fact Athos' wife, whom everyone thought dead. He now knows that Milady will never forgive him for having insulted her so dearly, and is relieved when all the King's Guards are ordered to La Rochelle where a siege of the Protestant-held town is taking place. The Musketeers and d'Artagnan are forced to purchase horses and equipment for field service -- this is no easy task for the impoverished Musketeers. Athos is able to get money from unknown sources, and Aramis has a mistress or two with gold in their pocketbook. Porthos is forced to rely on the wife of a miserly old lawyer to get the needed equipment, and d'Artagnan has to pawn a diamond given to him by the Queen as a reward for his trip to England. In the end, they are all able to join the La Rochelle campaign in reasonable style. Milady makes several attempts to kill d'Artagnan in and around La Rochelle, but fails. At the same time, d'Artagnan finds out that the Queen has managed to save Constance from the prison where the Cardinal and Milady had thrown her, and that his beloved is now hidden somewhere safe. One of the would-be assassins drops a valuable tip: the name of an inn where Milady was to pay him for his crime. Athos, Porthos and Aramis go to the specified inn and are surprised to overhear a conversation between the Cardinal and Milady: Richelieu commands her to assassinate the Duke of Buckingham, and in exchange, she asks him to "take care" of d'Artagnan. He will take no direct action but instead writes a blanket pardon for Milady: "By My Hand, and for the good of the State, the bearer has done what has been done." Once the Cardinal leaves, Athos confronts Milady and threatens her life, forcing her to hand over the document. The Comte de le Fère, as Athos was once known, is fully aware of her past, and Milady fears him among all men. When the four friends are reunited, Athos presents d'Artagnan the pardon issued by the Cardinal to Milady and urges the young man to keep it for his own use. Because of the war between France and England, any attempt by the musketeers to travel to England and warn the Duke of Buckingham would be considered treason. They decide to attempt to save the Duke by writing to the Count de Winter (who had returned to England after the war started) asking him to deal with his sister-in-law. The trusty Planchet, d'Artagnan's faithful servant, is chosen to carry this letter which is purposely vague to prevent them being condemned. The Count received the note just in time, heeds their advice, and apprehends Milady. She is held prisoner in a seaside castle under the guard of a Puritan named John Felton who is seemingly incorruptible. In the meantime, at La Rochelle, the Cardinal himself admires d'Artagnan's courage in the siege and suggests that M. de Treville admit him to the Musketeers. Thus, d'Artagnan's greatest dream comes true and he is extremely happy, for, in addition, the Queen has finally agreed to tell him where Constance is hiding: she is in a monastery near Bethune, in northern France. D'Artagnan and his friends depart for Bethune as soon as they are able. Imprisoned in England, Milady seduces the hard-hearted Felton and convinces him not only to help her escape, but also to assassinate the Duke of Buckingham. While the naïve Felton knifes the Prime Minister, Milady sails to France. She writes the Cardinal to announce that his orders have been fulfilled and that she will be in a safe place until she receives payment for the crime. As Fate would have it, Milady hides in the same monastery where Constance had been sent by the Queen. Not knowing who this stranger really is, the trusting Constance bares her soul to Milady. The scheming Milady realizes that her enemy d'Artagnan is expected to arrive at the monastery at any moment. She escapes just before his arrival, but not before taking her revenge: she poisons Constance, who dies minutes later in the arms of her beloved d'Artagnan. The Count de Winter is encountered soon after and gives the quartet the news of the Duke's assassination. The five of them arrange to track down the whereabouts of Milady and exact punishment. Athos leaves to fetch a mysterious man in a red cloak. The party track down the Countess' location: an isolated house on the banks of the Lys river near Flanders. She is trapped. The six noblemen try the Countess on numerous charges: the poisoning of Madame Bonacieux, the assassination attempts on d'Artagnan, accomplice to the assassination of the Duke of Buckingham, the corruption of the Lord de Winter's servant, Felton, and the assassination of her late husband Count de Winter (the brother of the current Lord de Winter). The most damning charge comes when Athos states that Milady, his wife, is a marked criminal with a brand on her shoulder. When the Countess demands that Athos present the one who branded her, the man in the red cloak steps forward. She immediately recognizes him as the executioner of Lille. The executioner then recounts Milady's early history. She was a beautiful nun who seduced the priest of her church -- the executioner's own brother. Desperate for money to flee to another part of the country, the priest stole sacred vessels and sold them, but the two were caught and held in jail. Milady seduced the jailer's son to escape. The executioner of Lille had the duty to brand both his brother and the woman who seduced him. While the executioner tracked down and branded her, his brother escaped from the prison and rejoined her. They fled to the province where the Count of la Fère was lord, pretending to be brother and sister. She then abandoned the priest to become Athos' wife. The priest, thus ruined and abandoned, learned that his brother the executioner was being held in prison in lieu of himself. He surrendered to free his brother and then committed suicide. After Milady is beheaded (in Flanders, technically), the musketeers return to La Rochelle. On their way, they encounter the Count of Rochefort, the Cardinal's close advisor and d'Artagnan's old nemesis, who was traveling to Milady to pay her. Rochefort also has an order to arrest d'Artagnan if he happens to find him. As they are near La Rochelle, he decides to postpone his trip to Milady in order to take d'Artagnan directly to the Cardinal. When d'Artagnan is presented before him, the Cardinal tells the young man his charges: mostly trumped-up ones intended to provide an excuse for Milady's desire to see d'Artagnan dead. The young musketeer tells the truth to Richelieu and recounts the entire story about Milady, her assassination attempts against him, her poisoning of Madame Bonacieux, etc. The Cardinal states that if Milady is indeed guilty, the courts will deal harshly with her. D'Artagnan frankly admits that they have already dealt with this evil woman. D'Artagnan then presents him the pardon that Athos forced from Milady, making his actions legitimate in the eyes of the Law. The Cardinal, impressed by d'Artagnan's bravery and having already used Milady's services to eliminate France's arch-rival Buckingham, offers the young man a lieutenant's commission with the Musketeers -- with the name left blank. The Cardinal then presents Rochefort and asks both men to be on good terms. D'Artagnan offers each of his friends the commission, but all three refuse, both due to personal reasons and because they believe that d'Artagnan is the most worthy of the commission. He is the only one of the four friends that remains in the Army: Athos retires to his estates, Porthos marries a rich widow and establishes himself somewhere in the countryside, and Aramis becomes a priest. Their lives, however, would cross once again, in Twenty Years After. Dumas brings out the inherited social character traits and values of different communities and nationalities. D'Artangan is a pure Gascon--hot heated, courageous, generous, clever and quick. Mazarin is a clever, deceitful crafty Italian. Apart from his social inheritance, individually D'Artangan is good. He is a positive personality that seeks positive values such as friendship, loyalty, courage, goodwill. His actions serve to preserve these values. His goodness is shown in his willingness to delay the duel with injured Athos, his siding with the three musketeers against the Cardinal's men, his meeting a good-hearted mentor in Treville, his willingness to risk his life to save Buckingham, which Athos prevents him from doing, and many small acts of interference to help a stranger. It is D'Artangan that gives strength and cohesion to the friiendship of the other three. Before that, they had suffered numerous defeats and were unknown. As soon as he comes, they are ushered into an audience with the king. He is the spark of life that energizes the four. Courage and fearlessness are the dominant values of the soldier. The musketeers are admired and respected even by their enemies for these traits. The absence of fear protects them. D'Artangan serves whoever is his master and whatever they ask of him is right. Athos is moved mainly by personal affection for his friends and later his son. His life has been darkened by the betrayal of those emotions by Milady. Porthos seeks fame , status, money and will do whatever is necessary within limits to achieve it. Aramis values his scret romances and intrigues, yet remains true to his friends. The four show a great generosity and bravado like freedom from the money value in their youth. In middle age they all seem to succumb to it in some measure, but always with a generosity that contrasts with the miserliness of Mazarin and Bonacieux. D'Artangan's initial meeting with Rochefort and Milady before even reaching Paris foreshadows what is to come.When she destroys the beautiful Madame Bonacieux, her own veil of beauty that concelas and evil, ugly nature is torn away and she is killed. Until then her beauty protects her. Neither D'Artangan nor Athos were able to slay when they had the chance. Even till the end, D'Artangan hesitates and Athos has to insist.Athos begins to emerge from his melancholy only when D'Artangan recovers the ring Athos had once given to Milady and it is sold. Rochefort steal the appointment letter meant for Treville and gives it to the Cardinal. Later it is the Cardinal that makes D'Artangan a musketeer and promotes him as lieutenant. The Count must be a positive character in a negative position. For it is he that first alerts D about Milady during their initial encounter. Later in trying to chase the Count in Paris, D runs into and enrages the three Musketeers which is the beginning of their friendship. The Count also drops the paper on which Milady has written the name of their final meeting place where finally the Musketeers catch and execute her. The Count also kidnaps Madame Bonacieux who later twice escapes him; the first time to meet D and fall in love which wouldn't have happened otherwise and as a result D plays a pivotal role in recovering the Queen's diamonds given to Buckingham. Thus after 3 duels, there is sanction for D's final friendship with the Count. Rochefort has a positive nature. In spite of his acts, all he does helps D'Artangan. He makes D'Artangan aware of Milady and later drops the paper that reveals her final hiding place. In chasing Rochefort, D'Artangan runs into and befriends the musketeers. He kidnaps Madame Bonacieux twice but both times she escapes. This leads to her meeting with D'Artangan and his commission to help the queen recover her diamonds, which makes him a hero. His work may be for the good of the country, but he acts through personal motives and negative character. Therefore he attracts to him people like Rochefort and Milady. Her motives are personal, but there are some positive personal values which attract to her positive people like Madame Bonacieux and D'Artangan. Artagnan (D) is confronted with the Cardinal's intriguers in the very first leg of his journey from home to Paris to join the musketeers when he quarrels with Count Rochefort and sees the mysterious evil Milady. The Count steals his father's letter to Treville requesting a place for D in the king's guard. Later it is the Cardinal himself (the Count's boss) who appoints D a musketeer and finally a lieutenant. When the Cardinal does offer him a lieutenantship it is in exchange for the Cardinal"s letter of authority which Athos stole from Milady and the Count is there to witness his appointment (the Count brings D to the Cardinal). D'Artangan's naive heroism leads to being beaten by Rochfort's men. Later the same trait leads him to unnecessarily provoke the bitter hostility of evil Milady. The 3 Musketeers rose to fame only after D'Artagnan joined them. Just prior to that they were defeated in a brawl with the Cardinal's men and Athos was wounded. After D'Artagnan joined them, they rose from success to greater success. D'Artagnan is courageous, noble, intelligent, innocent, with enormous youthful energy. Within a few days of his arrival in Paris, D'Artagnan has an audience with the king. Within a few weeks he is honored by the Queen. Why did Madame Bonacieux die? She serves an ungrateful queen and the vain selfishness of Buckingham, was married to a treacherous husband (why did she marry such an old man? ), against an all-powerful Cardinal. D'Artangan, her lover, was attracted to Milady, despite what he knew of her, deeply humiliated her without need in her bedroom, and interferred with her romantic interest in Des Wardes, making her vow to ruin D'Artangan and his own romance--which she does. Therefore, D'Artangan cannot save her. It is only because Milady killed her, that Milady is discovered and herself killed. Out of Madame Bonacieux's love for D'Artangan, she subconsciously sacrificed herself so that he might live. Richilieu's Purse: Richilieu gives a purse to Bonacieux to serve him. His wife steals it and gives it to D'Artangan to carry out the mission of saving the queen from the cardinal's plot to expose her. For stealing the money of her miserly husband, she incurs his wrath and he betrays her and helps with her kidnapping. The cardinal's money is used against him because he gives it to a weak, undeserving, treacherous man. But that same money refuses to serve the cardinal's enemies. Three of the musketeers get waylaid in carrying it. D'Artangan hardly uses it at all. In fact, the prize of 4 horses that D'Artangan gains from the Duke for his service, D'Artangan is forced to spend to extricate his friends from trouble. So they do real service and gain no personal benefit from it. Queen Anne's ring: Earned by D'Artangan in service of Anne, he gets the ring and then spends it again in service of the Duke. Years later it comes back to him for further service. Diamond studs: Buckingham forces Anne to give him a gift and later she is forced to ask for it back. He is able to keep only the empty box, symbol of the fact that he never gets Anne whom he seeks. The box too comes back to Anne with the Duke's murder weapon in it, because his unsanctioned love of Anne is in fact the cause of his death. Apart from the Duke's vanity, Anne is undeserving of that affection and therefore he dies in trying to offer it to her. Athos' Ring: Milady obtained Athos' family ring by falsely representing herself and becoming his wife. Athos is haunted for years by the memory of this woman he thought he had killed. Later D regains Athos' ring by another fraud when he impersonates Comte de Wardes in Milady's bedroom. From that moment on the haunting spell begins to lift from Athos and he regains his old strength and character. The ring is sold. From the time D'Artagnan first sees her, milady's life is on the decline though her evil power continues to express. She succeeds in stealing the diamonds from Buckingham, but the plot fails when D'Artagnan brings replacements to the Queen and thereby gains her esteem. When she attempts to seduce De Wardes and kill her brother-in-law, she is instead seduced by D'Artagnan and exposed to him and Athos. When she asks the Cardinal for an execution order to kill D'Artagnan , Athos steals it from her, and later uses it for her execution. Going to kill Buckingham she is exposed and imprisoned for the first time. Though she escapes and succeeds in her mission, she brings down on her the pursuit that finally costs her her life. The poisoning of Constance Bonacieux is her last evil act which alerts the Musketeers to her identity and brings on her death. Even at the end her evil is so powerful, D'Artagnan hesitates before the execution.Because D'Artagnan has fallen prey to Milady's charms in attempting to court and seduce her, and he has interfered with her passion for Des Wardes, Milady is able to rob D'Artagnan of his love for Constance and leave it unsatisfied. Constance was living in a dangerous world of intrigues. She was the servant of Queen Anne's romance with B and as such evoked the revenge of the Cardinal who could not directly touch the Queen. She was married to an unprincipled small man had only led to her twice imprisonment and twice escape. The force of the Queen protecting her was powerful enough for that. Her death rather seems a direct result of her love for D and willingness to die for him. Milady was bent on revenge against D and was powerful enough to make D tremble at the thought of her. In exposing herself to Milady, she actually exposed Milady to the Musketeers who would not have found her at the convent or pursued her to her grave, had it not been for C's unconscious sacrifice. In dying, C ensured Milady's death and D's life. Whatever the liberality of the day, the story takes place in an age when the belief in good is quite pervasive and religious issues dominate society. In fact, if one law seems to express throughout the story, it is the resistance to illicit love at higher levels of society. Buckingham's advances to Anne lead to his death. Constance's two attempts to unite with D'Artagnan are frustrated, the first by her arrest, the second by her death. Even Milady's passion for de Wardes is frustrated by D'Artagnan . Aramis returns to religion, not to his aristocratic lover. Only Porthos who seeks money, not love, and stoops to the level of the proprietress succeeds, and that too by marriage. There is no instance of illicit love prospering in the story. Buckingham used the battle for La Rochelle as an opportunity to fight his personal battle with the Cardinal who had once been rejected by Anne and was jealous of Buckingham . Buckingham employed the religious opposition of the Huguenots to fight the Cardinal. Their personal quarrel was ended by Buckingham's assassination and with it the war too ended. As Buckingham employed religious fanaticism against the Cardinal, Milady employed Fenton's Puritan fanaticism against Buckingham . Buckingham was killed when he tried to sign the exile order against Milady. The knife Fenton used to kill Buckingham was the same one Milady used a few hours earlier to stab herself in a feigned suicide attempt. The knife draws her blood which gave it the power to draw Buckingham's and also foreshadowed her own death, for killing Buckingham was something so great it could be paid for only with Milady's life. She was killed by the executioner's knife a few days later. The Cardinal's plot to expose Queen Anne was thwarted by D'Artagnan , while his plot to kill Buckingham was a success. The Frenchman's loyalty to his Queen does not extend to her lover who is a national enemy preparing to attack.The musketeers can save the queen, their monarch, but not the duke, who is the country's enemy. Athos realizes this. Milady died in the countryside where she grew up; it was her return to past dangers, not safety. By killing Constance, Milady has betrayed the one thing which protected her all her life, i.e. her beauty. Till then no man could bring himself to kill her. Athos failed years earlier and then did not even attempt it when he met here at the tavern. De Winter only attempted to exile her and could not accomplish even that, so great were her charms. But when she destroyed beautiful Constance, her own mask was finally destroyed and the protecting aura withdrawn. Even then D'Artagnan was moved by her pleas and only Athos' intervention assured her execution. By going to the convent, Milady unthinkingly returns to the village where the executioner lives and still seeks vengeance for his brother's corruption and death which were due to Milady. The story portrays individuals of positive and negative character pursuing socially accepted goals and expressing higher values in pursuit of those goals. The goals are limited to maintaining the prestige of the Queen, honour in the face of challenges to ones bravery (D'Artangan), personal power (Richilieu), wealth and status (Porthos). The goals are not idealistic, beyond the scope of being true to the social values of the day like courage, loyalty to one's master, etc. Doing what is right or good or true in its own spiritual sense is not a motive. The story depicts commitment to high values in the limited social context--goodness, loyalty, friendship, generosity, etc. The progress of the society expresses through the personal motives and aspiration of the individuals. Social evolution takes place through development of individual ego. None, except perhaps Richilieu, consciously seeks the evolution of the society. The Queen seeks to fortify her position, Buckingham seeks power and romance, Louis XIII tries to maintain the facade of kingship, the musketeers seek to fulfill the dharma of soldiers. The story takes place at a time when absolute monarchy is developing as a means to create a unified, national identity. In seeking to strengthen the monarchy against the devisive, fragmenting force of feudalism. Richilieu serves the development of national consciousness and unification of France through the instrumentation of his personal ambitions for power. Athos espouses commitment to the principle of monarchy. Others act only for personal motives. The monarchs (Louis, Anne) act purely out of personal pride and ambition and prestige, with no thought for the good of the country. In their minds, they 'are' the country. Everyone was expected to serve and subserve the self-importance, prestige power and privilege of the monarch. Today every person seeks those things for himself!